DUSHANBE (Avesta news agency) — The opening ceremonies of the new buildings of the Tajik border guard agencies took place at the Nizhniy Pyanj checkpoint in the Khatlon region and the Tem of the Gorno-Badakhshan autonomous region. 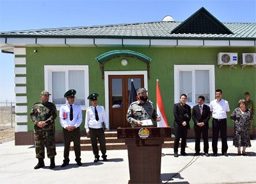 As representatives of the British Embassy, he International Organization for Migration of the United Nations in Tajikistan, Afghanistan and the leadership of the border troops of the country took part in the ceremonies, the press service of the frontier troops of the State National Security Committee told Avesta. According to the source, the customs houses at the Nizhniy Pyanj and Tem offices have been built by the United Kingdom and the International Organization for Migration of the United Nations within the framework of the implementation of border projects. These buildings are built for representatives of border agencies of Tajikistan and Afghanistan and meet international requirements, the press service of the border troops of the State National Security Committee of the Republic of Tatarstan reported. Tajikistan and Afghanistan share a roughly 1,300-km border, most of which is in rugged terrain and is poorly protected. Currently the porous border between the two countries is a major concern for both governments, as well as the international community. The border is a major route for drugs being smuggled from Afghanistan to Russia and Europe. Moreover, Tajikistan and Afghanistan have experienced significant violence and political volatility in the past 25 years. Shortly after its independence from the Soviet Union, Tajikistan fell into a civil war lasting from 1992 to 1997 that claimed an estimated 50,000 to 100,000 lives and displaced more than 1 million people. These events followed the Soviet withdrawal from Afghanistan, which led to a rise in radical Islamist and militant movements in Afghanistan and Tajikistan such as the Afghan Taliban and the Islamic Renaissance Party of Tajikistan. Afghanistan also went through a civil war after the Soviet withdrawal, contributing to the Taliban’s rise. The border also does not neatly correspond to demographic distribution, since northern Afghanistan has a sizable number of Tajiks. Indeed, Afghanistan’s Tajik population (8.2 mln, or 27% of the country’s total population, making Tajiks the country’s largest minority) is greater than the population of Tajikistan (6.2 mln). Transportation links between the two countries, such as the Afghanistan-Tajikistan Bridge, are slowly being rebuilt, often with help and financing from external governments.